Wigan left-back Erik Edman could be out for up to six months after rupturing the cruciate ligament in his left knee. The Swede was injured in last weekend's Premier League match at Blackburn. Latics manager Steve Bruce said: "It's a real shame for us, because Erik has looked so natural, and we will certainly miss him." Bruce must now consider how to cover for the 29-year-old Edman, with Kevin Kilbane the most obvious player to fill in at left-back. 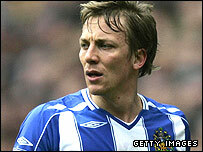 Swedish international Edman signed for Wigan from French club Rennes in January. He first joined the Premiership with Tottenham from Dutch side Heerenveen in 2004 after starting his career with Swedish side Helsingborgs. Bruce added: "He's also a lovely lad and a terrific professional. But he'll get over this and be back for us, I'm sure. Everyone at the club wishes him the best."